Today, PlayKids, one of the fastest growing kid’s apps in the world, announces new content deals and launches a Chinese New Year theme to bring a taste of the cultural tradition to families around the globe. This news comes after a stellar year for the company that played over half a billion episodes globally. 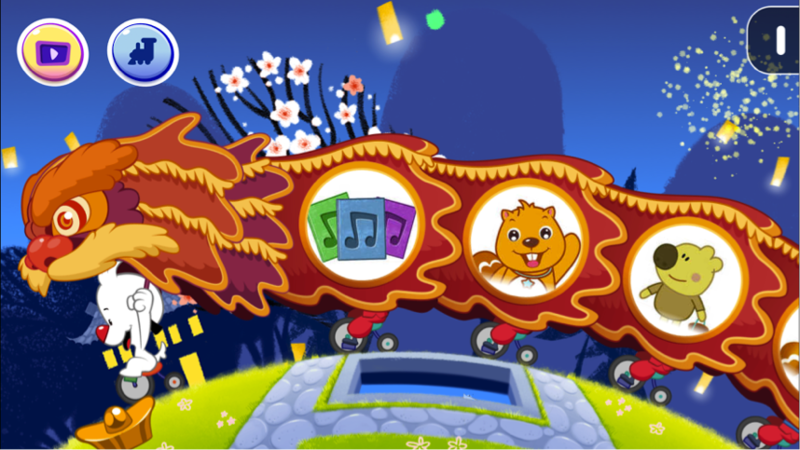 Newly added shows like Scholar Cat, a cartoon produced by Vasoon Animation, and celebratory songs from Beva Songs, a popular title with over 20 billion views on streaming platforms, pay homage to the Chinese New Year. Additionally, PlayKids added a series of audiobooks that draw from a variety of literary sources, timeless Chinese stories and fables from Aesop and Andersen. The new content is available in China and joins the app’s extensive list of shows from media companies like DHX Media, Entertainment One, HIT Entertainment, The Jim Henson Company, PBS, and Viacom. PlayKids’ move into China in December 2014 was a calculated one. According to Ernst & Young, Internet penetration will continue to grow rapidly with 500 million wireless broadband connections expected by 2016. Furthermore, the importance of education is deeply embedded within Chinese culture and there is a need for high-quality, educational children’s content. The Chinese New Year theme features a colorful dragon packed with PlayKids signature mix of lullabies, nursery rhymes, activities, shows and eBooks, as well as celebratory fireworks, jumping carp and other sights and sounds common to the festival. Chinese New Year is a holiday marking the start of the lunar calendar year and honors ancestors of families in China and across the world in countries like Macau, Taiwan, Singapore, Thailand, Indonesia, Malaysia and the Philippines. Known for its lantern festival, red envelopes and colorful paper decorations, the festival is a time for families to gather and make way for good fortune and luck in the coming new year. PlayKids is a children’s entertainment platform packed with entertaining and age-appropriate videos, eBooks, nursery rhymes, games and lullabies specifically for children aged five and under. As a trusted source for parents, PlayKids offers entertaining and educational programming for children and features offline viewing so families can save on data usage and provides parental controls. Learn more at playkidsapp.com. Movile is the creator of PlayKids and is one of the largest mobile platforms in Latin America. Its product portfolio includes smartphone and tablet applications for content and commerce. Movile has over 500 employees and is connected to more than 40 carriers that collectively have over 700 million mobile subscribers. More than 30 million people experience Movile’s products and services per month. Learn more at movile.com/en.